Hey guys! Hope everyone is surviving the aftermath of Halloween! As they get a little older my boys are starting to last longer trick-or-treating...that's good and bad! It was unseasonally hot here-which is fine with me! I can't remember the last time it wasn't miserably cold here. It was like 80 degrees! As a result my boys sweated like crazy in their costumes and then pretty much passed out when they got home. They slept a little later today, which was nice, but too bad they had school today! Today I have a Lush Kitchen item for you....is this my first Kitchen item reviewed here? I think so, yes? Discovering the Kitchen has been very bad on my wallet...and my sleep schedule! The items get released daily at 8am England time, which is 2 am my time! Luckily I've only gotten up a couple times to order and I've had pretty good luck with the hot ticket items! Anyhoo, Twilight shower gel is an item that comes out a few times a year in the Kitchen, to my knowledge. I really like the scent of the Twilight bath bomb so I figured I'd try this! The smell is very similar but not identical to the bath bomb. I find it to be a little more musky and not as sweet, or as strong smelling. And, in the picture below, you can see the silver luster they put in it. It tends to settle to the bottom, and so you'll need to shake it up if you want that experience in your shower! Not being a huge fan of glitter in my bath products I leave it as is and I exit my shower glitter free! 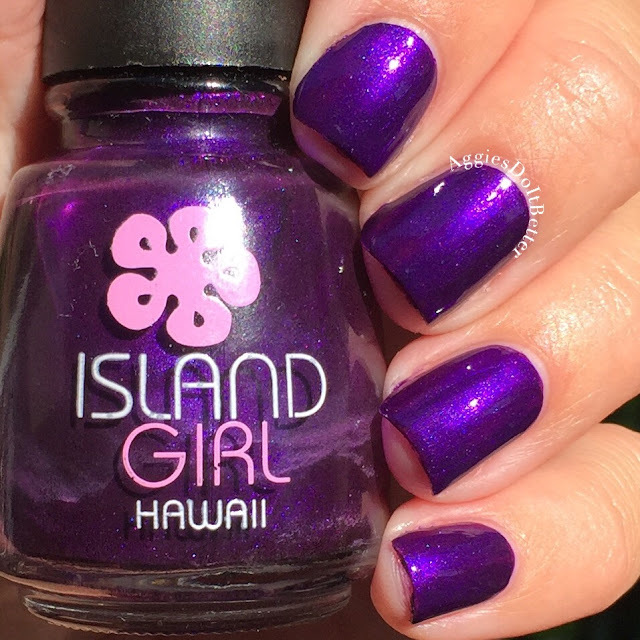 The polish I paired Twilight with is Island Girl Hawaiian babe, my first ever Island Girl! Doesn't it match exactly??? You can see my review of it here. Disney's Moana inspired nail art with stamping! Thanksgiving 2016: Thanksgiving Disney nails!